This is the first English-language book to explore the ROKN and its ongoing process of blue-water modernisation. 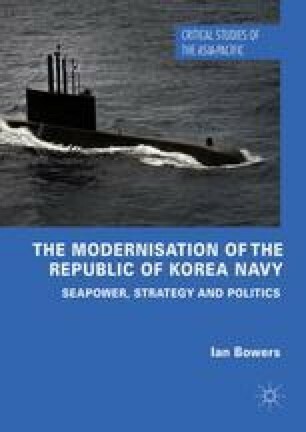 This book argues that a new perception of South Korea’s maritime security requirements combined with greater South Korean access to modern naval technology facilitated a new approach to naval operations and seapower. One where mobility, multi-functionality, connectivity and lethality have primacy. These strategic and technological factors have coincided with a changing political landscape, which has been more amenable to the concept of an expanded operational role for the ROKN. The book contends that the United States first constrained but now facilitates and encourages the ROKN’s goal of an expanded operational role. The ROKN has engaged in a campaign to persuade the public and political elites of the importance of seapower and naval power to South Korea’s security and prosperity. It is shown that this effort has been partially successful and blue-water modernisation has matched the political and strategic vision of successive South Korean presidents. However, this volume emphasises that naval modernisation is a long-term project and resource-intensive endeavour and ROKN ambition remains vulnerable to changes in the strategic environment and the political orientation of the country.